When new skills become in demand as fast as others become extinct, employability is less about what you already know and more about your capacity to learn. It requires a new mindset for both employers trying to develop a workforce with the right skillsets, and for individuals seeking to advance their careers. It’s time to take a fresh look at how we motivate, develop and retain employees. In this environment, learnability – the desire and capability to develop in-demand skills to be employable for the long-term – is the hot ticket to success for employers and individuals alike. Up to 65% of the jobs Generation Z will perform don’t even exist yet and up to 45% of the activities people are paid to perform today could be automated using current technology. This won’t necessarily mean fewer jobs, but it will mean new jobs requiring different skills. Add to that the fact that 38% of employers tell us they’re already having difficulties finding people with the right skills to fill open jobs and it's clear that there’s a mismatch. Anticipating what the skills of the future might be is critical if we are to build a sustainable pipeline of talent. According to a survey by ManpowerGroup, millennials say success depends more on having the right skills than the right connections. 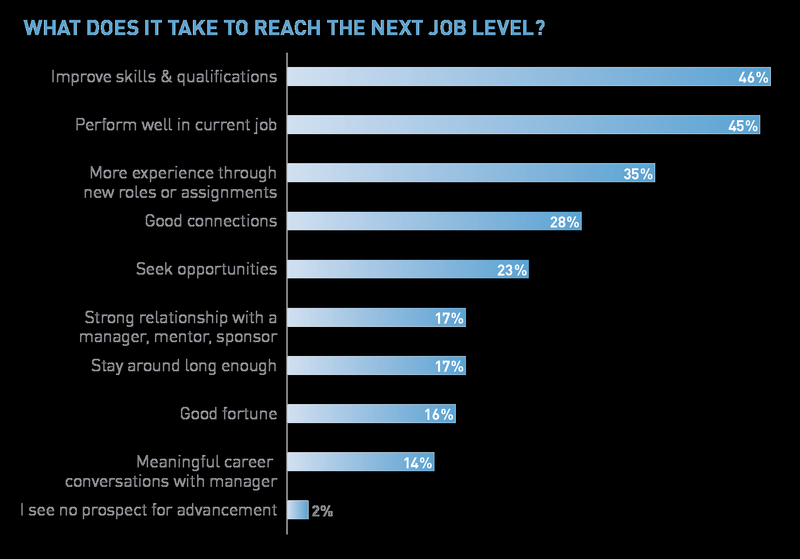 As business needs change, employers are focused on skills too. JP Morgan Chase is offering development in business-critical skills such as software development and network engineering, while AT&T is providing nano degrees to make sure its workforce is prepared for the shift from a hardware-oriented focus to software-defined IP networks. ManpowerGroup is working with a number of companies to identify the skills that will be needed in advanced manufacturing and our own employability programmes include MyPath , a selection of tools providing our associates with assessment, guidance and education – including free college degrees – to help them develop the skills we know are in-demand. The purpose? It's a way for working people to “future proof” themselves no matter who their employer may be and creates opportunities for people to boost their career success. It also enhances the competitiveness of organizations and all the time helps build more sustainable communities in which we all operate and our employees live and work. Employers can harness the appetite of their employees to learn. Our research found that millennials value new skills so highly that many are willing to spend their own time and dig into their own pockets to pay for it. For employers, motivating and retaining employees with learnability means finding new ways to nurture a learning culture and to reward it day-to-day. This creates a virtuous cycle. It challenges employees to make themselves more valuable to the company and in turn keeps them engaged and stimulated in their job, boosting retention. 1. Look beyond the resume. Many organizations continue to pay too much attention to academic qualifications and hard skills. While these can be important, what entry-level employees learn during university often doesn’t equip them for today’s job market. Look for employees who are enthusiastic and demonstrate a willingness to learn new skills. 2. Select carefully. Offer the best learning opportunities to employees who you know will take advantage of it. Make it clear to employees that having the opportunity to cross-train and learn new skills is a prize to be earned by demonstrating curiosity and a genuine interest in acquiring new knowledge. You’ll get more bang for your buck by focusing on individuals with higher learnability. 3. Model learnability. If you want your employees to embrace learning as a habit, you need to set an example. Sure, we’re all busy, but it’s important to carve out time to expand your own mind. Ask yourself, when was the last time you read something from an unusual perspective, and not just another article one of your friends shared on Facebook? When have you taken the time to wrap your head around a new industry? To engage in conversation on a subject outside your comfort zone? Curiosity is a muscle prone to atrophy when exposed to the online world of instant information. To keep that skill sharp, we all need to take the time to find unfamiliar topics and dig beneath the surface. 4. Recognize learners. Put your money where your mouth is when promoting learning. We’ve all seen how well monetary incentives and competition work in motivating employees to change their physical fitness habits – think of team Fitbit challenges – so why can’t we do the same for mental fitness? We could reward employees who organize internal activities that promote learnability, such as bringing in external speakers, hosting roundtable discussions or simply writing a blog and sharing challenging pieces on social media. Consider rewarding learnability by only promoting employees to a higher level after they have gained lateral expertise in other departments. The best employees want to broaden their expertise, so provide them with opportunities to challenge themselves. If you’ve managed to build a team of employees hungry to learn and grow – good. But the job doesn’t stop there. The kind of organization that will survive into the future needs to successfully feed those learnability cravings and keep the virtuous cycle turning.